The Modelling Hall of Shame | The M.o.B. Every once in a while a model comes along that is basically so bad it is not worth building. Now I am not talking about a few rivets extra or absent, or some dimensional inaccuracy that can only be measured with an electron microscope. No these are some examples of the modeling world’s real clangers. Part 1: A first time for everything. Sometimes a manufacturer starting a range of kits comes out with an absolute gem. Eastern Express went on to produce a respectable range of T34s and related machines, but before that they dropped this abomination on the world. 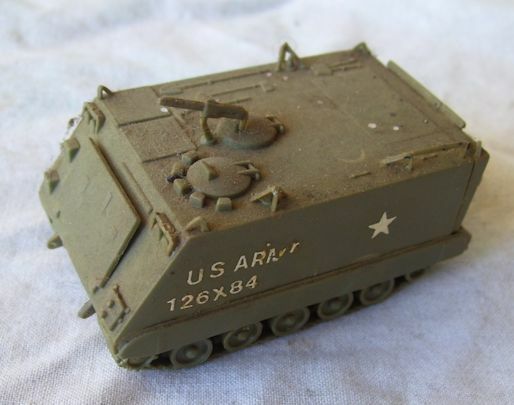 This is not a housebrick on tracks, it is supposed to be a M113. I think what happened was that draftsmen Sergei and Ivan bumped into each other, their glasses fell off, and they each picked up the other’s pair. This might explain the total lack of proportion, but not the decals. Some manufacturers use decals from Cartograph, in this kit they came from Fantasy Island. The decals too turned into alphabet soup as soon as they hit water. Ace is another Russian model company, which has been going for about 15 years now. In that time they have launched a vast range of AFVs, trucks and artillery pieces. 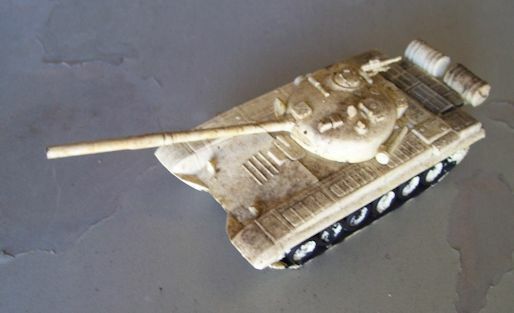 Their first effort was this T72. I did attempt to build this kit, it would have been simpler to start with a solid block of styrene and a Stanley knife. It is always a good idea to clamp the mold together before pumping in the styrene, but apart from that the one slight problem was that absolutely nothing fitted anything. 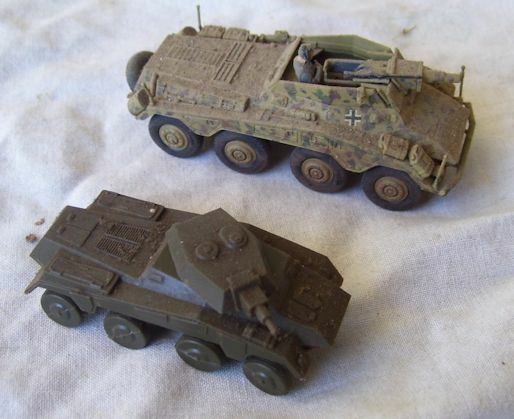 Arii, also known at various times as Edai or Grip, produced a range of 12 1/76 WW2 German diorama kits, a vacform base, a vehicle or two. Some of their vehicles could actually be useful. One was a Mobelwagen flakpanzer. At the time unique, but the lower half was a bit too wargame for my liking. I transplanted the Mobelwagen superstructure onto an Airfix Panzer IV and the result was perfectly fine. However some of their creations must have been tooled up by the work experience kid. Here is their entry for the Hall of Shame, allegedly a Sdkfz233 8 wheeler armed with a short 75. Here is what a proper one looks like. The prosecution rests, M’Lord. Sometime in the Nineties appeared Science Treasury from China. From the subjects I knew in one second that their entire range of 1/72 AFVs were all knockoffs of 70s Hasegawa, like this Daimler armoured car. So far so good. Now Hung Well, who was assigned the job of copying Hasegawa’s decals, just said bugger it, and came up with these beaut stickers. I believe they came to Hung’s flat in the middle of the night and he hasn’t been seen since. 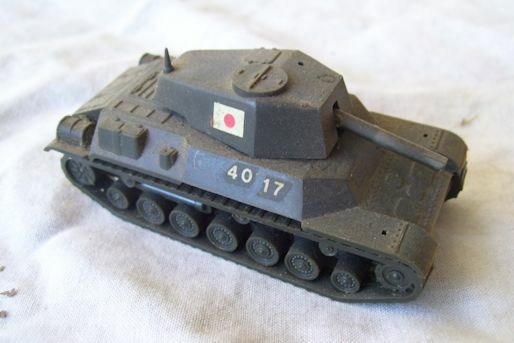 The heaviest tank fielded by Japan in WW2 was the Chi-Ha, replicated in scale by Airfix, Fujimi and recently Dragon. The intention was to produce a better medium tank, this was the Type 4, which existed as an indeterminate number of prototypes. None were shipped, they were retained in Japan for the expected invasion. Not a topic that you would expect anyone to model, but Midori gave it a go. 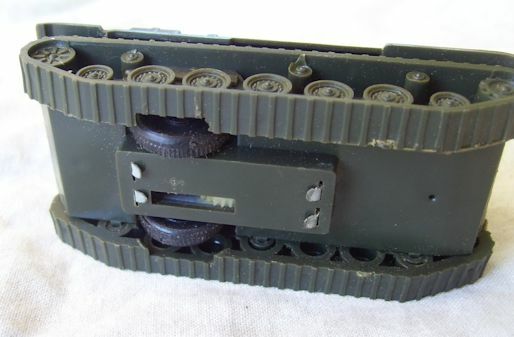 Midori were a Japanese maker that produced a small range of tanks. Midori’s Type 4 is a whole six pieces, and although it looks the right shape, detail wise it is as smooth as Telly Savalas’ head. Inside is a clockwork motor driving wheels through the hull floor. It is a shame that Midori’s objective was not to make a true scale model of a Type 4 instead of something to scurry along the floor like a mouse. 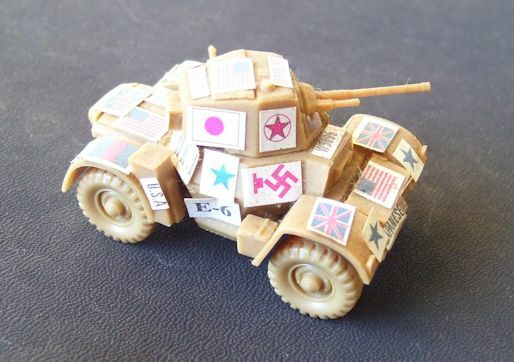 Wargame models are popular these days, typically simplified and often not requiring glue. For even better value often these come two in the box. These are aimed at lazy wargamers who don’t can’t come to grips with kits comprising of several hundred parts. Donkey’s years ago Airfix made what was the first range of wargame models. These were polyethylene, or “soft plastic”, the same stuff used for their figure kits. Polyethylene has the advantage that it is indestructible. It is also immune to any paint or glue, so the prospect of improving the model didn’t exist. Airfix made 11 vehicles in this range, and fortunately 10 of them have for some time been available as proper polystyrene kits by Aifix and others. The odd one out is the Thorneycroft Antar tank transporter. Dinky also made an Antar, in metal of course, and in their own weird scale. 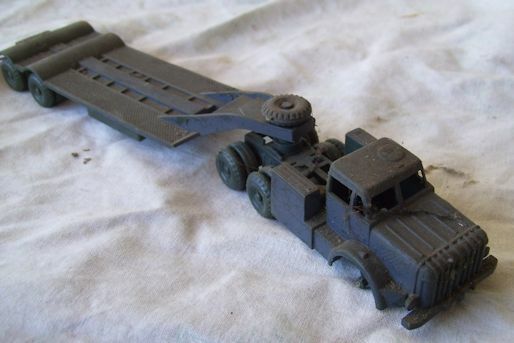 I found an Airfix Antar at a swap meet years ago, it is missing parts but I thought it might be a means to an end. However there is no point. The Airfix Antar is one of modelling’s great lost causes, it would be like fixing an axe by replacing the head and then the handle.